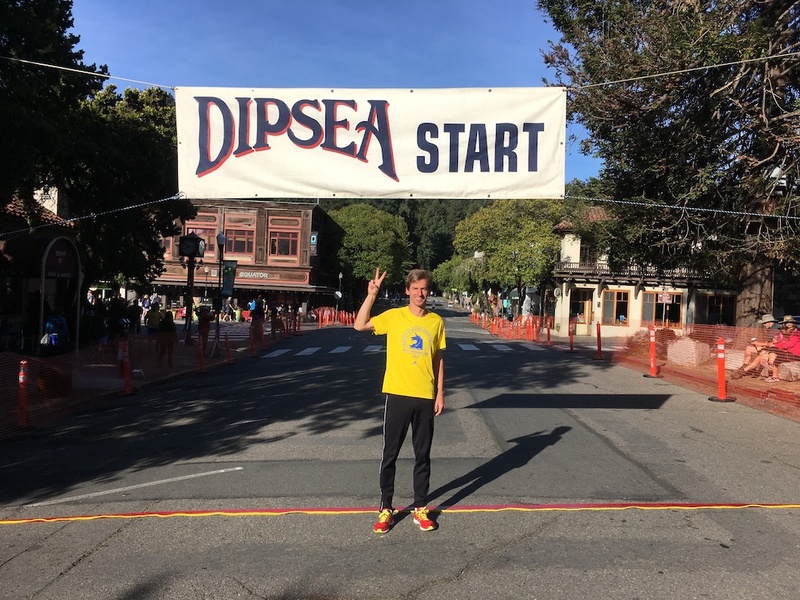 On June 10, 2018 I ran the 108th running of the legendary Dipsea race. I finished in a time of 1:08:26 – good enough to requalify for next year. The following is a detailed account of my race day. It is long. This is my way of paying it forward to future athletes & documenting it so I can remember later on. 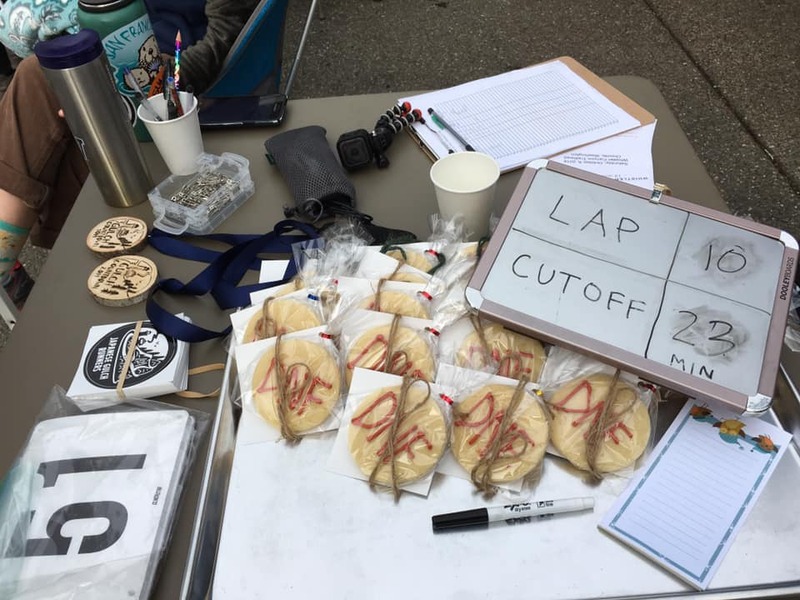 Only 1,500 runners get to participate in the Dipsea every year and many more try to apply. 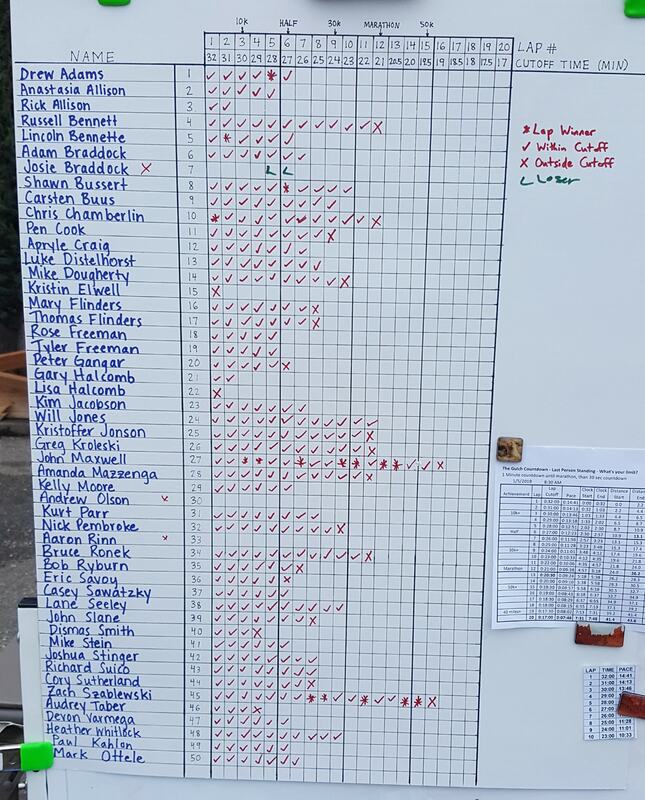 600 of those spots go to runners that ran well the year before. 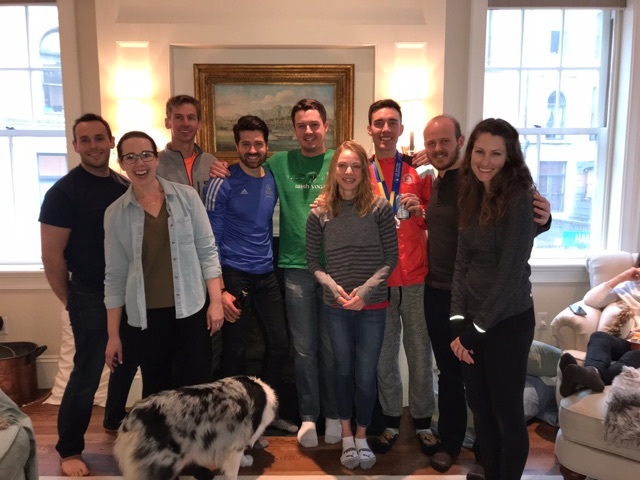 I ran the race last year and did well enough to come back – that race report is here. 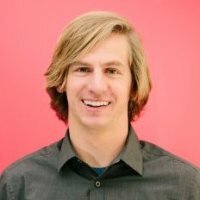 My goal this year was just to get invited back for next year and to make sure my friend Chris did as well. 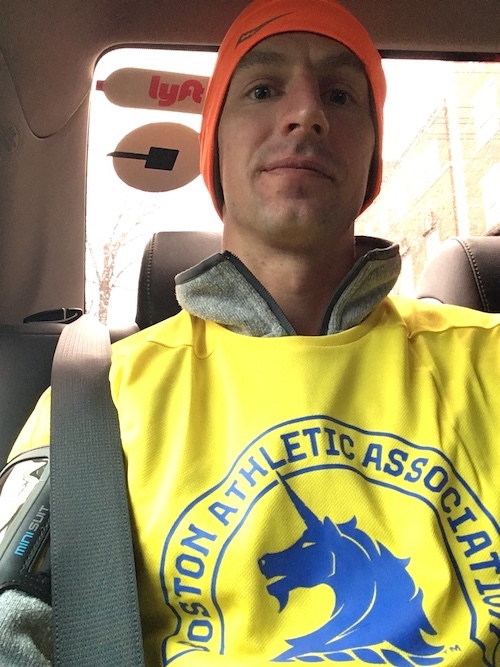 We’re both decent runners and normally wouldn’t have much trouble with that, but he broke his ankle earlier this year and I had only run 8 times in as many weeks since a calamitous Boston Marathon in which I had to drop out due to a hypothermia scare. We knew that to be able to come back next year we would need to run somewhere between 1:10:30 and 1:11:30 so that is what I calibrated our pace milestones at. 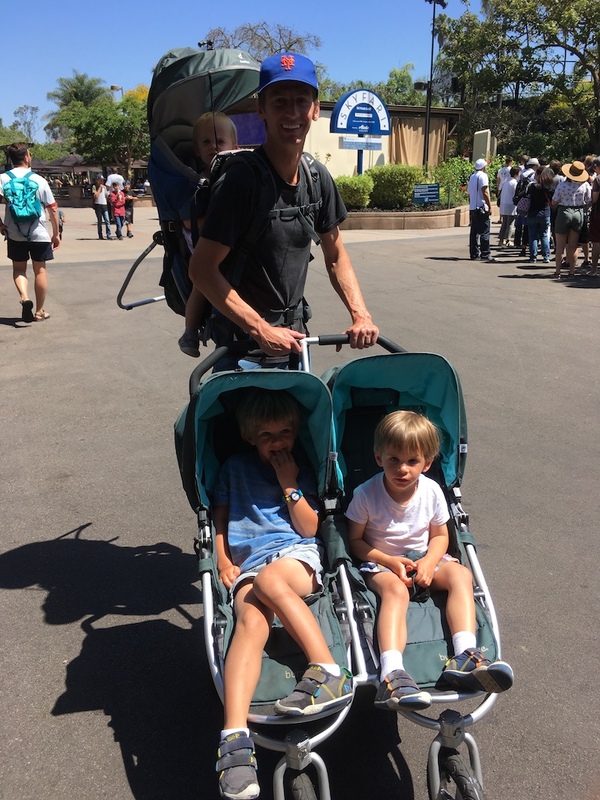 For those curious how a father of four got to go away for a weekend and run a race – negotiations included two Saturday mornings taking the three oldest kids to the zoo by myself. 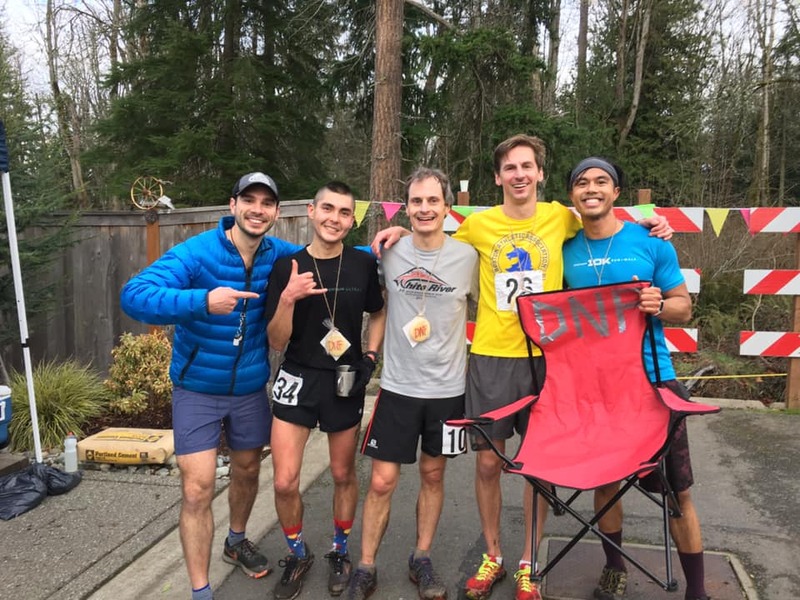 The Dipsea has one of the most unique race starts I’ve ever heard of. There are ~50 groups that start one minute apart and runners are seeded based on a handicap system that accounts for age and gender. The first group to start includes men 74+, women 66+, 7 year old boys and 6 year old girls. It then works it way back until the last group – men age 19-30. Official info here. A great writeup by the NYT here. That mixture of gender is age is true for the winners as well. 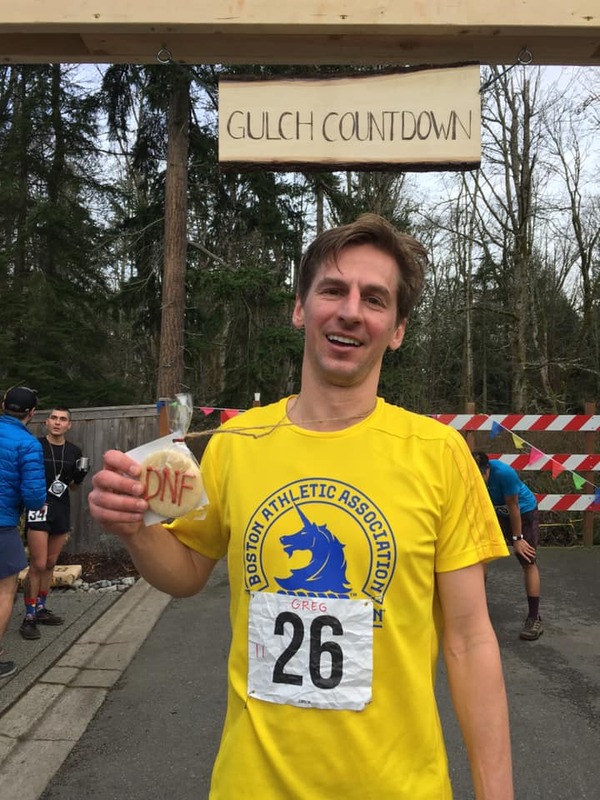 Normally the winner of a running race is a 19-30 year old male, but at the Dipsea it has been over 50 years since a 19-30 year old male has won the race. The reason I love this so much (despite the fact that it disadvantages me right now) is that as I get older, I can still improve my overall ranking each year. I will certainly get slower as I get older, but that will be counteracted by the head start minutes I get. That means this is the type of race I can continually aim to improve at. That is pretty special. 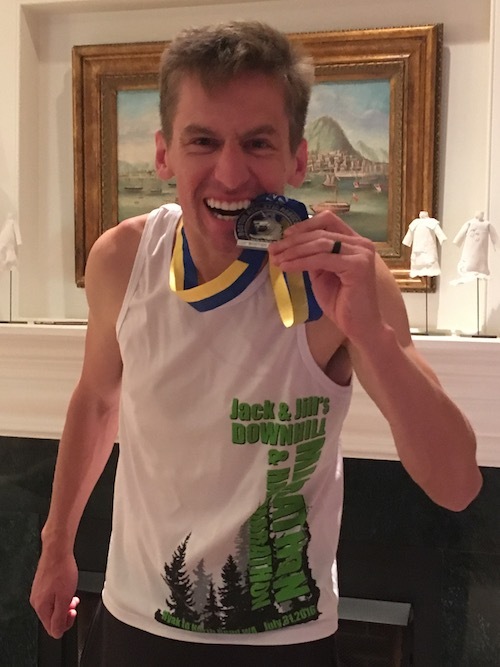 It is a life goal of mine to earn a Black Shirt – an award that goes to the top 35 finishers every year. Last year, as a first time runner I was in the open wave, running with a much less competitive group. I got 2nd place in my start wave and 21st of the 900 open runners. This year I started in the invitational wave with the fast runners who had qualified in previous years. Lined up near me was Alex Varner, the 7 time winner of the fastest time award as well as Gus Gibbs, another frequent face in the top awards. I would not be getting 2nd place for my start wave (I actually ended up getting 48th!). I would be getting a 1 minute head start for the first time as I’m now 31. So I had that going for me. Chris and I started off slow and steady, enjoying the only flat part of the course. Our plan was to stick together and pull each other through tough stretches. We didn’t have much concern for the other runners around and nothing major happened over the start. 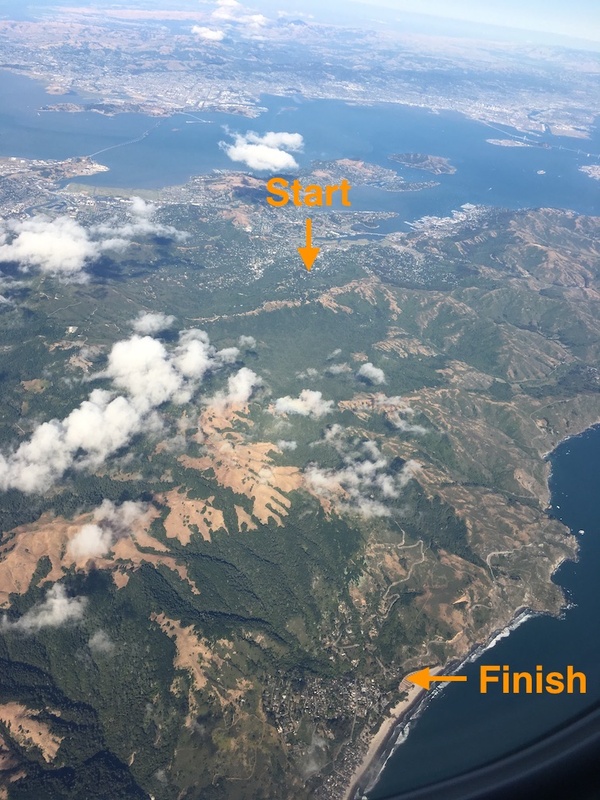 The Dipsea race has many reasons to be famous, but the stairs tend to be one of the more dreaded and well known. At 688 stairs in total, runners climb the equivalent of over one third the Empire State Building. 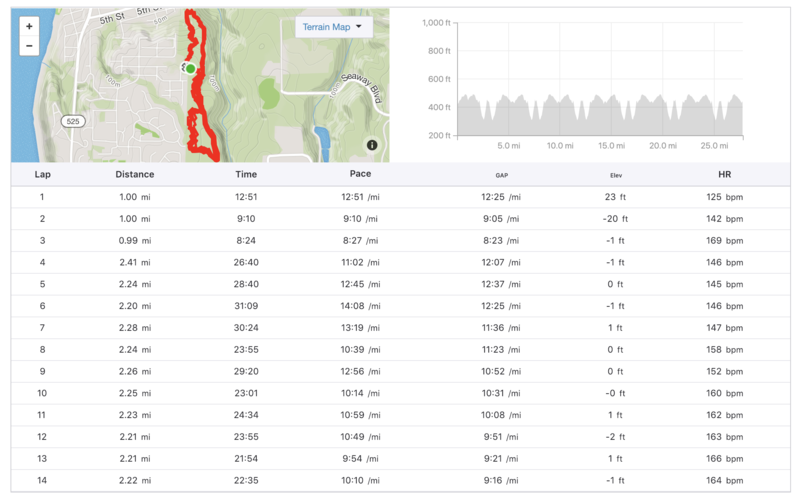 Last year I had some heart rate goals for various sections of the course. I learned from my planning mistake. This year my goal was to hit the stairs, redline and then do everything I could to hold it until I got to the finish line. We planned to get to the top of the stairs by 8 minutes. We got there 15 seconds early despite a decent bit of speed walking. I made great use of my arms on the stairs, the only section where you have a railing to grab on to. By this point, my lack of fitness was starting to be evident. I wasn’t passing people like last year, I was struggling just to keep moving. Chris and I traded the lead a few times and did our best to pick off any runners we could while the trail was wide. As we got out of the tree cover we got to see how hot a day it already was and I was glad to have some ice water to cool my head down. Last year when I hit Windy Gap, I got really bottlenecked. This year that spot was pretty open. 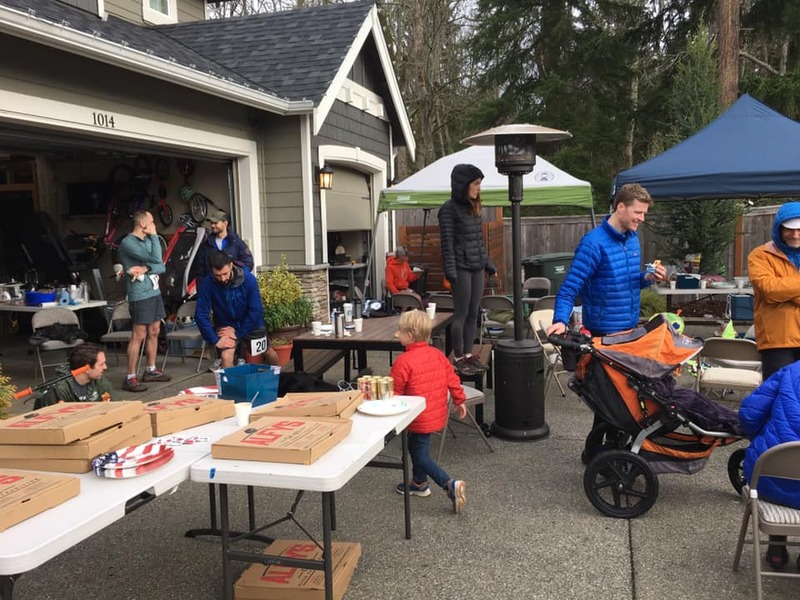 This probably has a lot to do with me being slower and the other runners in my wave being faster – I wasn’t catching as many people early on and would hit bottlenecks later this year. There was a lot of mud of the trail and steps, which made this section pretty challenging. 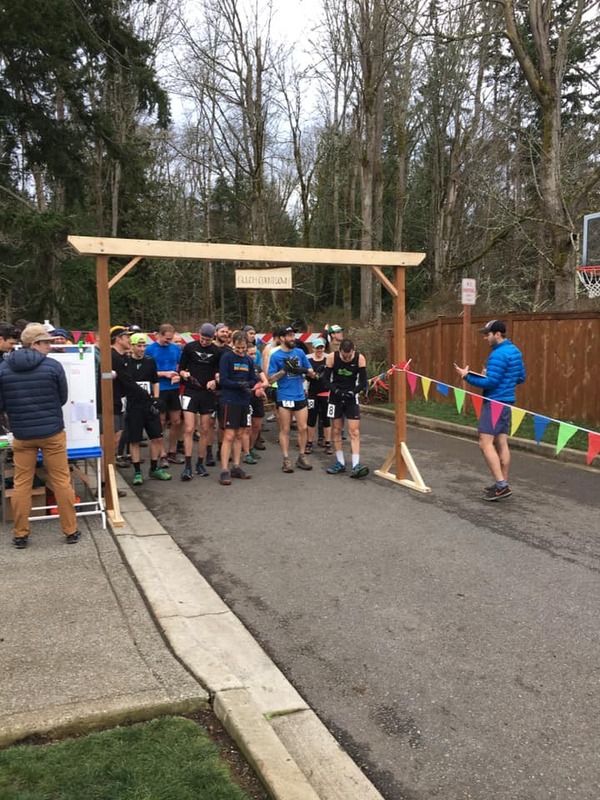 After clearing that in one piece, I welcomed the downhill pavement section where I briefly went sub-4 pace and picked off a number of runners. The ‘Suicide’ shortcut was a mess. There were too many people there so I couldn’t really run it. By having to put on the brakes, I was much less stable. I debate if going the long way at a running pace would have been worth it here. At this point I knew Chris was a bit behind me, my plan was to let off the gas a bit and let him catch up so we could work together up the big climb. Our goal was to hit the bridge as 19 minutes – I was dead on and he was just a few seconds back. The next hill is the biggest. In total it is two miles that climbs 1,200 ft. You can see it here from mile ~2 to mile ~4. It starts off with Dynamite – a steep section of switchbacks on muddy trail through a lush green forest. I did a lot of speed hiking through this section and traded the lead with a few different runners who would jog past, then stop and walk as you jogged past them. None of us had it in us to continually run. By this time Chris had caught back up with me as well. 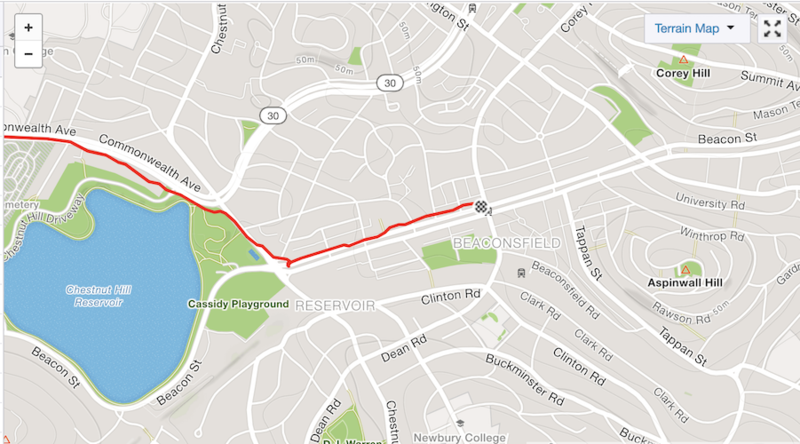 We had wanted to hit ~12 min/mile pace up to the top of Cardiac, which should put us there by ~44 minutes. We ended up averaging 13 min miles – 20 mins/mile through the first section and 11 mins/mile on the steady part of the climb. We traded the lead back and forth, putting 5-10 seconds between us. We were both redlining. When I felt good I’d pass Chris and encourage him along. When I felt bad, he’d catch me and I’d do my best to stay as close as possible. We passed my water bottle back and forth and had a few jelly beans I was carrying to make sure we were alert for the downhill. We did a great job sticking to the trail, which is narrower than the fire road but a bit shorter distance to run. It ended up working out great and I don’t feel we really got stuck behind anyone. It also seemed to be a bit more tree covered, which was nice in the heat. I was watching my watch and getting a bit worried we were too far behind schedule. I never really know how close we are when I’m on the hill because everything looks pretty similar and you can’t see the top. 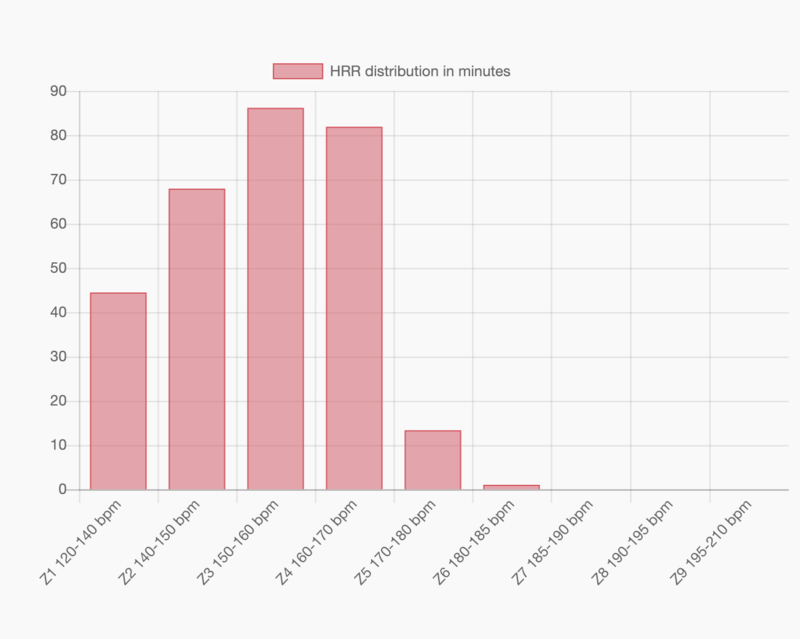 We ended up hitting our goal time right on the head though – cresting at 46 minutes. With our goal of ~1:10-1:11, this meant that we had 24-25 minutes to get down the hill. Last year I did it in 20, but was really flying. I felt pretty safe at this point that we could do it barring any injury, so we planned to play it pretty safe. The final part of the race is a huge downhill on steep, technical, mostly single-track dirt trails with a few roads thrown in towards the end. You can see it here from mile ~4.25 to mile 7. The downhill starts off a fairly mellow rolling trail at around 5%. This is the exposed part of the course where you can see the headlands and the ocean. You want to enjoy it, but you have to pay close attention to your footing because there are lots of rocks sticking out. Chris was right in front of me at this point and we were passing a few runners every 10-15 seconds. Last year I flew on this section, but this year it was the section where I was slowest compared to last year. 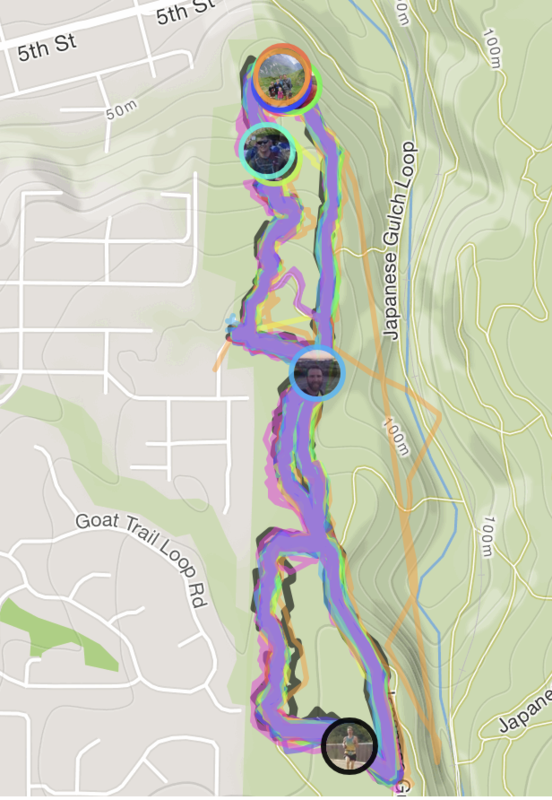 At some point a runner fell off the trail, downhill into a bush and was laying with her feet in the air. It is all kind of a blur, but I recall a lady yelling in an intense panic, ‘someone please help her’, though the woman seemed pretty calm about it. There was another lady trying to help her up by the hand, but that wasn’t going too well as the fallen woman was basically upside down & caught in a bush. I stopped, grabbed her elbow and with one strong motion had her upright on the trail, at which point I jumped to the side and started running again. It was so fast, I can’t even see it on my GPS. But it was long enough that when I looked for Chris, he was nowhere in sight. It took me about a mile to catch him. We hit the split between the main trail and the Swoop shortcut and one runner took the long way while everyone else in sight took the shortcut. Because of that, the Swoop was a disaster. There were too many runners going in single file and no one was passing anyone else because it seemed silly to pass one person when there were 10 other people right in front of them going the same speed. Yelling ‘on your left’ meant nothing here as the trail was pretty thin. 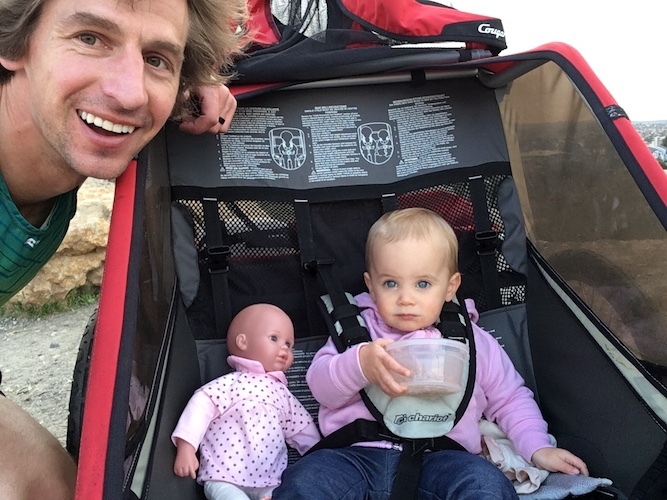 This is a tricky race etiquette situation. The other runners are trying to go as fast as they can by picking the safest footing they can see. If they move to the side to let you pass, they are slowing themselves down to help you – their competition. 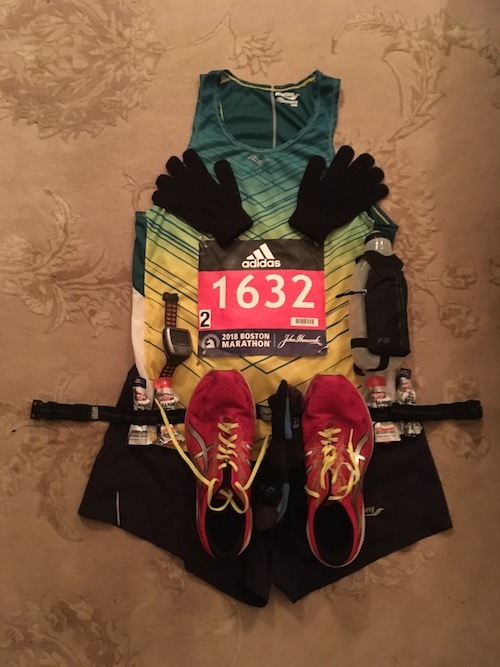 On the other hand, if you chose not to move and to intentionally use your body as a physical barrier to another runner, it is hard to blame them for getting physical as well. My strategy was to yell, ‘on your left’, stick my hand out in front of me and tap at their left arm and then come on through, regardless of what they had decided to to. If they had accommodated me, great. If they hadn’t, they would get a physics lesson. Even with all of this effort, as we got out of the Swoop I noticed the runner that had taken the long way had gotten to where the trails meet each other at the exact same moment. It was all for nothing. Quite frustrating. 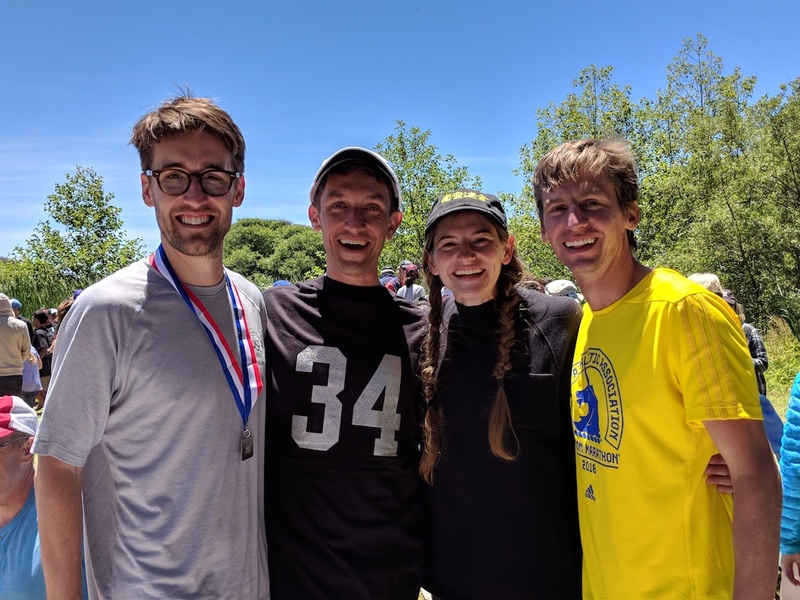 At this point I was pretty sure Chris and I were safe to requalify and I knew he wouldn’t be pushing it too much on the downhill because of his ankle – so I left him in order to enjoy a bit of speed through the final mile. The last climb is a short but steep climb that is aptly named ‘Insult Hill’. Frustrated by the bottleneck in the Swoop and less than exhausted, I kicked it into high gear and got around a number of people. This is where I got lazy and stopped calling out my passes. One runner I was passing made a quick hop left to get around someone else and I hit them pretty hard. Not hard enough that they went down, but hard enough that I felt bad about it. The final mile alternated between paved roads and trails that cut between curves in the road. The trails were not very worn, most sections looked freshly trimmed back and teeming with poison oak. I was letting loose on the roads, but the trails were basically walking pace only. 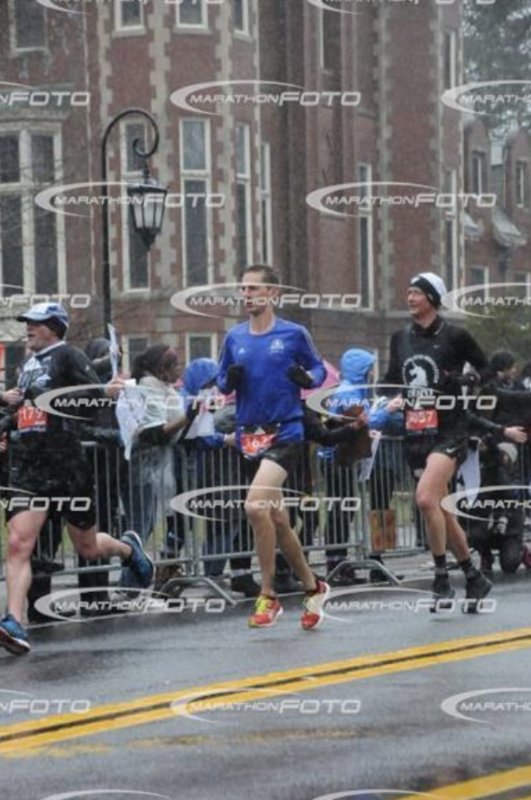 This was really hard mentally as I was trying to get to the finish line quickly to make sure I requalified. Last year these sections were wide open for me as I had done all of the passing earlier on in the course. By the time I had gotten here, there were only ~30 people in front of me, meaning things were pretty spread out. 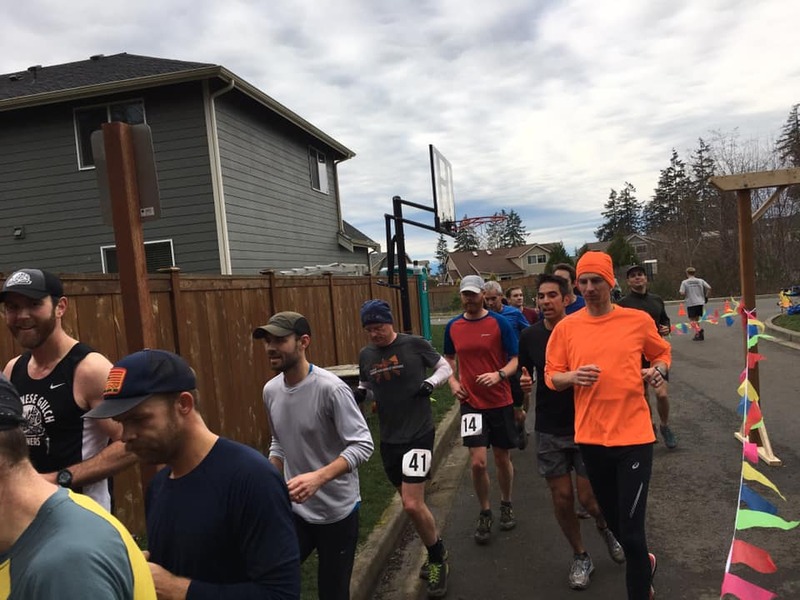 This year the early parts of the course were pretty open and the bottleneck came here. By this point this year there were ~350 people ahead of me, so it wasn’t open at all. The lesson is that you’re going to have to pass people at some point, it is best to strategically do that in ideal places to pass, like the long climb up the wide trail of cardiac. The final quarter mile drops 120 feet and is all on asphalt. Though slower than last year, I ran it at about 5:10 minute/mile pace averaging 186 BPM. 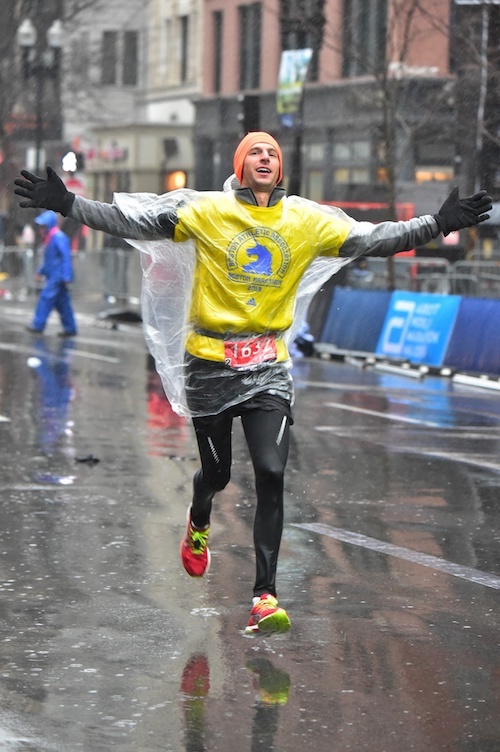 This is always such a great finish because you can really push yourself beyond what you think is possible thanks to gravity giving you a boost. I hit the finish at 191 BMP, finishing at 1:09:25.31, right at the low end of what I was targeting. I looked back to see where Chris was and before I could breathe normally again, he was coming across the line at 1:10:01.03, right in the middle of our target range. A perfect execution. 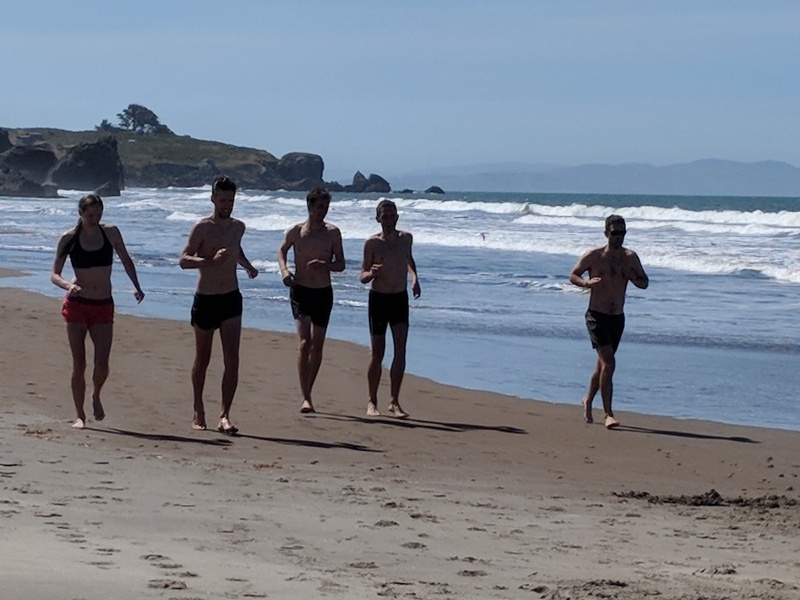 We then hopped immediately into the ocean to try and get the poison oak oil off and went for a light cool down run, doing our best Chariots of Fire. 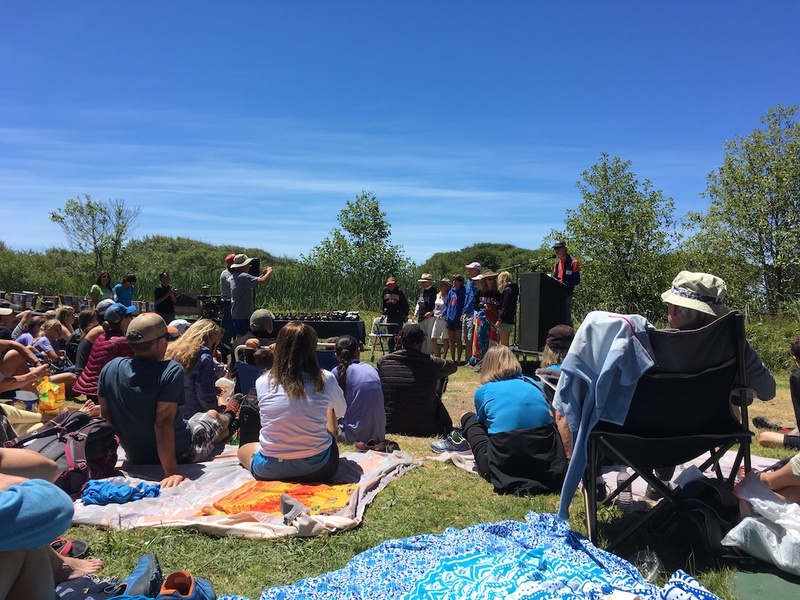 Then comes the annual picnic and award ceremony – for the Dipsea, the ceremony is kind of a big deal. For many races only the top three finishers and a few fans stick around to see the awards. 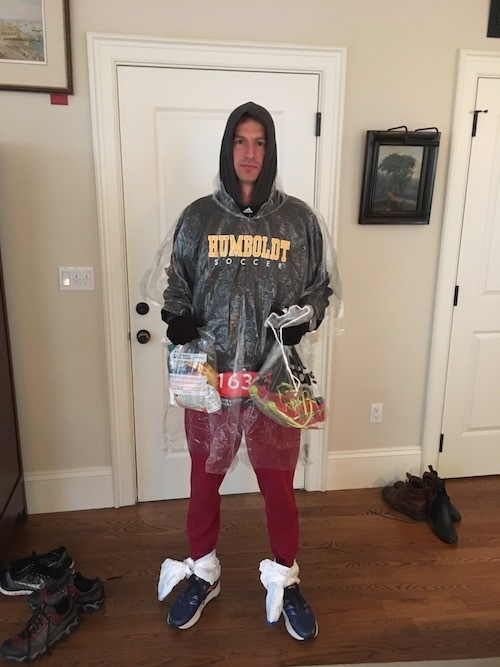 For the Dipsea, there are about 40 awards and in the two years I’ve been there, I haven’t seen a single runner that wasn’t present. Here is a pic of some of the past winners of the race all gathered together. Because of the crazy handicapping & starting system, depending on how you count it, I either got 48/69 in my start wave, 54/72 of all runners in my age group, 209/1,415 fastest time of everyone racing or 333/626 in the invitational, accounting for the handicaps. Basically it was a mid-pack performance. Our friend Loren, however, had a phenomenal year and got a coveted Black Shirt for the first time. Gretchen ran her best race ever and is getting within range of a Black Shirt herself. Chris and I just requalified, but neither of us got hurt and that was good enough for this year. It looks like there were ~560 runners that started ahead of me and 332 that finished ahead of me, including 29 that had started behind me. 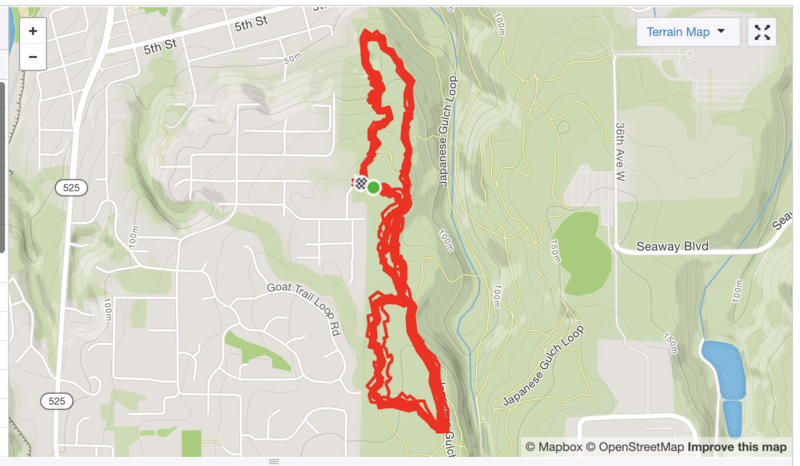 So I passed about 257 people – or about 1 every 150 feet. I know there was some back and forth passing though this year, so the actual number of passes might be closer to 300 or 350. 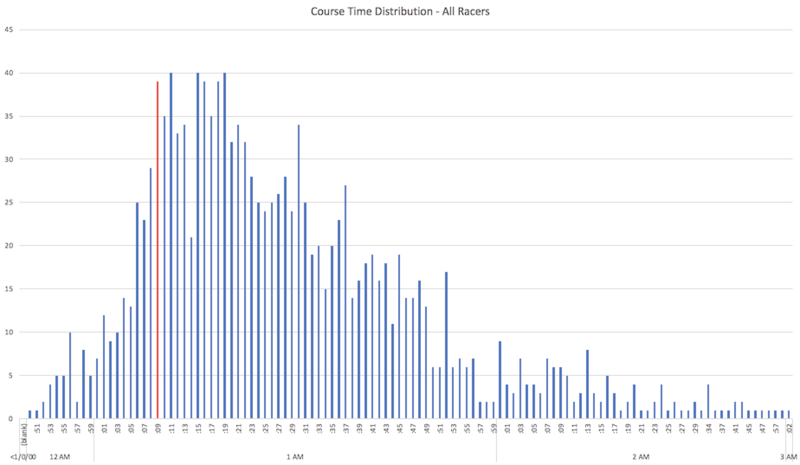 This is the distribution of race times for everyone that raced. I’m much closer to the middle of the pack than I normally am. That is what I get for not training. Pace wise, you can see I was all over the place, as is to be expected from a trail race with lots of hills. My peak pace was around 3:30 per mile and my slowest was around 20:00 per mile. I averaged 9:47 per mile. Effort wise, as measured by heart rate, my plan was to redline and then just hold it until the end. 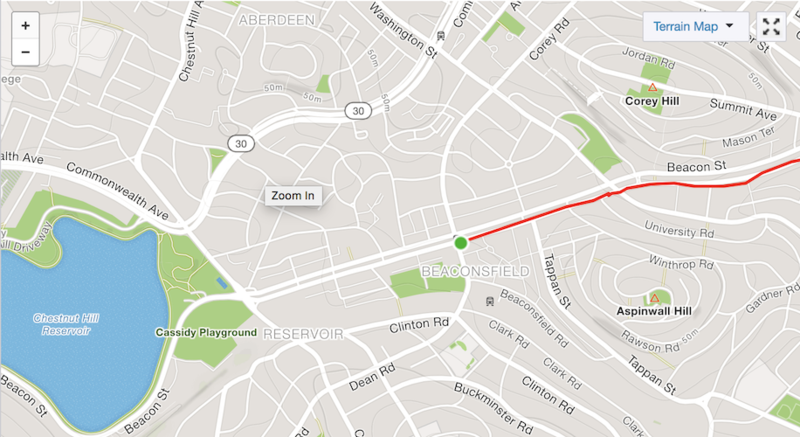 You can see I did a great job at the first part of that, hitting the red zone within the first half mile. There were only a few parts where I feel like I wasn’t putting on the gas. The first is as I started down the first hill, and that is because it was a very technical and somewhat crowded section – I immediately spiked it back up when I got to the road. The next was at the top of the big hill, I was enjoying the view a bit and got caught behind some runners. I made a push out of that but got caught up again in Steep Ravine. You can see the big spikes when I hit Insult Hill, followed by another drop as a walked through a crowded section where passing was impossible. Finally, an all out finish that took me to a heart rate I haven’t seen since last year’s Dipsea. Next I wanted to look at a comparison to some other runners that I was near during the race. 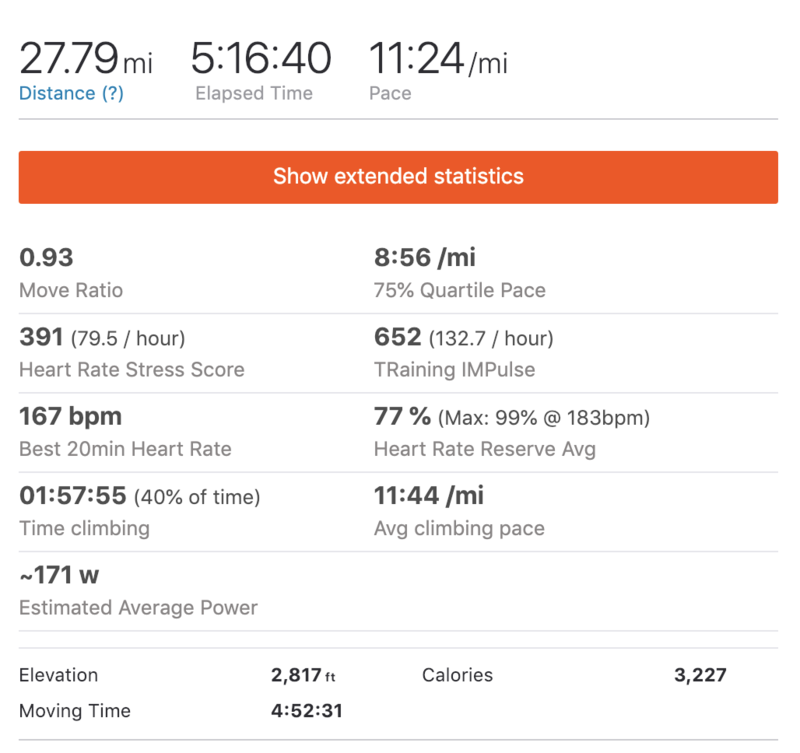 This data all comes from Strava. 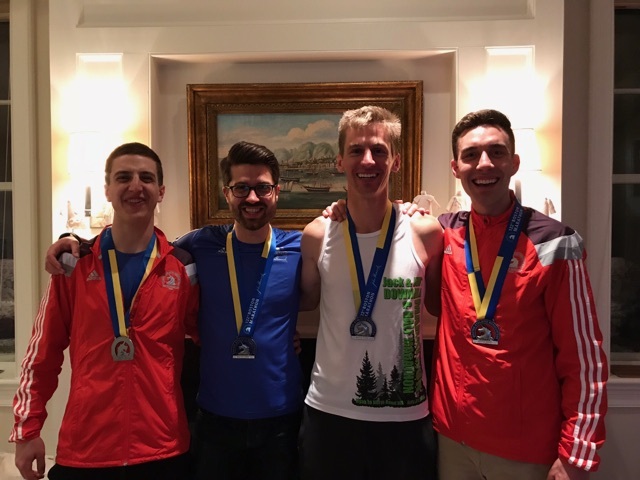 First, here are a few runners I stared with and how we finished. Interestingly, they were all ahead of me and behind me at some point. 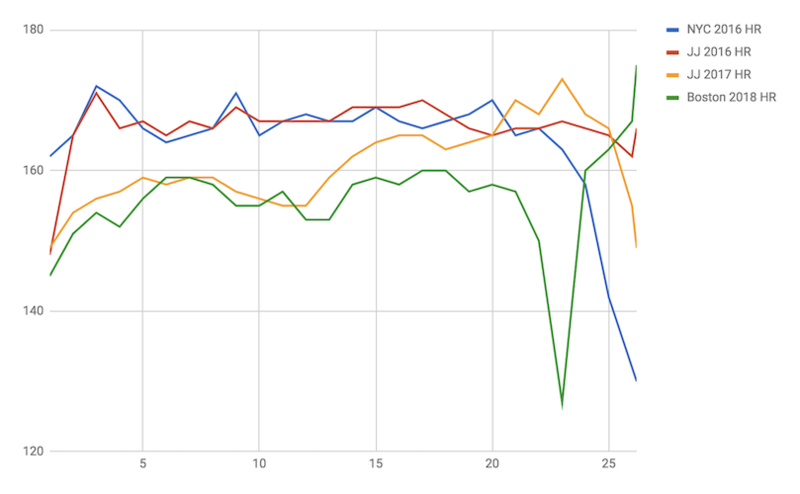 The light blue line was a runner that passed me right before I got bottlenecked – it looks like being just one minute ahead of me helped them avoid that issue. Here is just comparing me to Alex Varner and Gus Gibbs, the two fastest runners from my start wave. Basically they put distance on me right from the get go and never let up. The only section where I was even close to their speed was the first downhill. Here is looking at a few runners that started ahead of me but finished behind me. 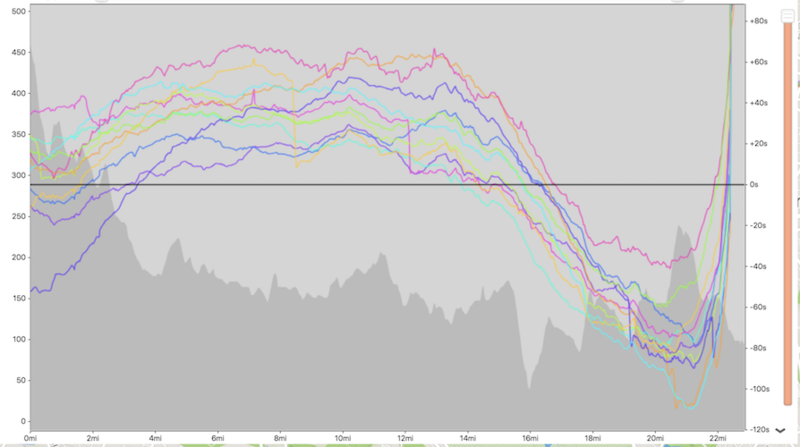 More or less, steady lines, but you can see a few spikes in sections where I got blocked up. 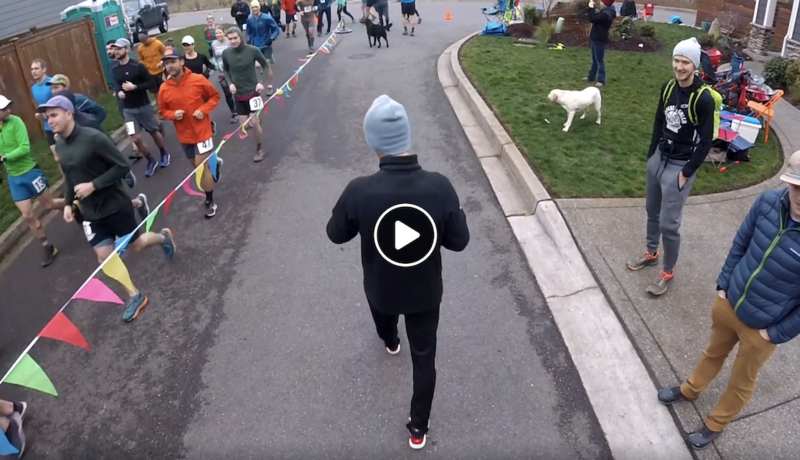 Notice around mile 4.5 where they all jump a bit – that is where I stopped to help a fallen runner. I was curious how the different start corrals broke down and what percent of the finisher from each finished in the top 35. The chart below breaks that out. You can see there are more runners towards the right side, in the start groups of younger, more fit runners. 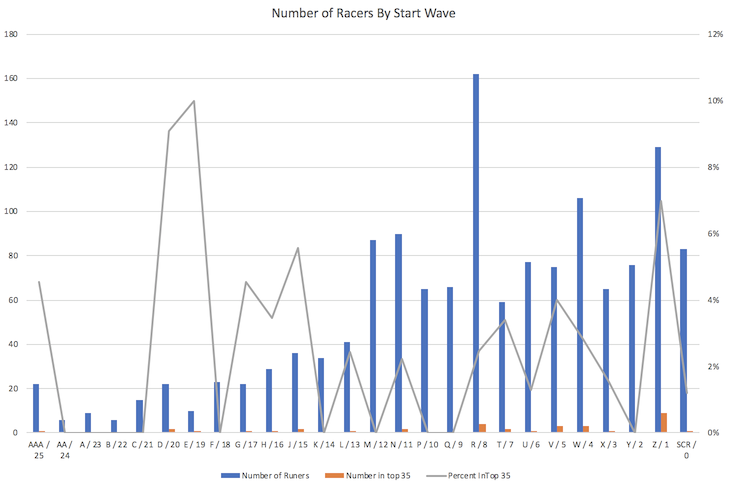 The big spike at start wave R/8 is where all women 19-39 go, which is why there are so many in that wave, it includes all of the peak racing years for women. 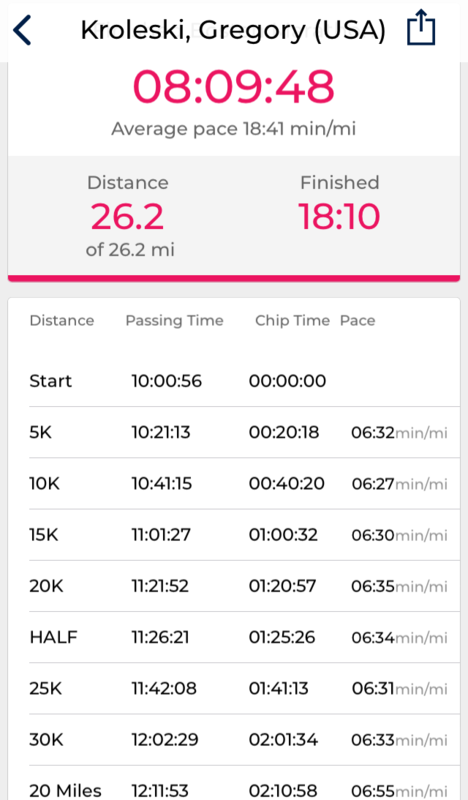 What is really interesting is there are 9 runners in the Z wave, the group that I was in that had a 1 minute head start, that finished in the top 35 and only 1 in the final wave. Perhaps this is a race where being over 30 isn’t as detrimental as the handicaps would imply. Or perhaps there are a just a bunch of great runners that have all aged into the Z start wave together and the final wave just hasn’t yet attracted enough high caliber younger runners to replace them. The top ~450 people from the open section get invited back next year to run in the invitational section. I got 333rd so I will be invited back again. 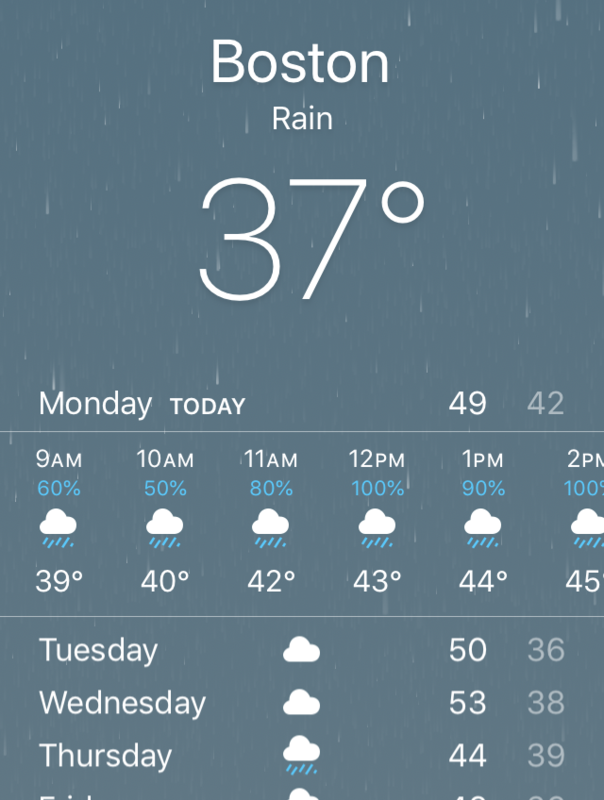 I’m not 100% sure I will run it, but I still want to attempt to break one hour eventually, so I kind of have to keep running, otherwise I might not be able to enter again. Remember, it took me 5 years to get in the first time, I don’t want to wait that long again. We’ll have to see if next year ends up being a good year to shoot for a record or if it will just be another year of trying to requalify.